Technology: Thread Grinding Services are alternative threading processes used where thread cutting or thread forming is impractical or insufficiently accurate. Thread grinding is a common method of producing threading taps in hardened tool steel and is used to make threads for ball screws, etc. where precision is critical. Thread grinding uses single or multi-thread grinding wheels to produce threaded shafts "from the solid"--that is without grinding pre-existing thread forms. Some multi-edge wheels use different pofiles to rough and finish cut the threads in a single pass. Thread grinding is used for particularly demanding applications where cracks in the thread root cannot be tolerated. It is useful for making threads in hardened steels where heat treating after threading could leave distortion. Advantages: Thread grinding services produce highly accurate threads compared with thread cutting. 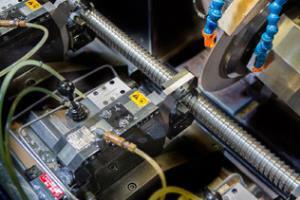 Applications: Thread grinding is ideally suited to making highly accurate thread forms.